Kobo Products offers various Titanium Dioxide and Zinc Oxide Dispersions and Powders. These Attenuation Grade Dispersions are available in various carriers and provide low whitening and SPF or yield an optimal efficacy against UVA and/or UVB. Kobo also offers Titanium Dioxide, Zinc Oxide, Transparent Iron Oxides and Non-Nano Composite Technology that may contain inorganic and organic surface treatments to improve their dispersion in formulas and physical and chemical stability. Titanium dioxide (TiO2) is a well known pigment, because of its high refractive index. It also functions as an effective UV absorber when the primary particle size is under 100 nm. Titanium dioxide is ideal for formulating mild or hypoallergenic sun care products for UVA/UVB protection for babies and children, and consumers with sensitive skin. It's the physical and chemical stability of titanium dioxide, which differentiates this filter from organic UV absorbers. Kobo specializes in the custom formulation and dispersion of TiO2. We offer a wide selection of titanium dioxide dispersions that include various particle sizes, surface treatments, and a wide range of carriers, including volatile solvent bases. Zinc Oxide is used in cosmetics primarily as a skin protectant and for UV attenuation. It is ideal for formulating mild or hypoallergenic sun care products for UVA/UVB protection for babies and people with sensitive skin. Zinc Oxide is available in a wide range of primary particle sizes and varying optical properties. Kobo specializes in the custom formulation and dispersion of zinc oxide. We offer a wide selection of ZnO dispersions that include various particle sizes, surface treatments, and a wide range of carriers, including volatile solvent bases. There is a current trend in the market to move away from volatile cyclic silicone products, namely Cyclopentasiloxane. Kobo is a global leader in pigment dispersions including attenuation grade and pigmentary grade Titanium Dioxide, Zinc Oxide, Iron Oxides, and Organic Pigments. In addition to offering these pigments in cyclic silicones, several Volatile Non-D5 options are available that have properties that are similar to cyclic silicones. Based on many years of experience, Kobo has carefully selected carriers and dispersants that mimic the volatility of cyclic silicones. These dispersions continue to provide transparency and protection from UVA/UVB light. 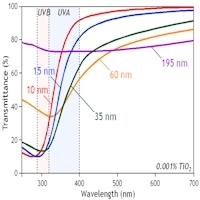 Attenuation grade TiO2 often has a size of less than 100 nm. Surface coated TiO2 with a primary particle size of 15 nm and 35 nm are widely used for UV protection nowadays. TiO2 with a primary particle size of 10 nm is the latest development in TiO2 technology. They can be ground into finer particle and give higher UVB protection and better transparency. Attenuation grade TiO2 with a variety of surface treatments are now available for an easier dispersion in a wide variety of carriers. Because of the relatively lower reflective index, ZnO of a large size can be used in a formula without causing significant whitening. 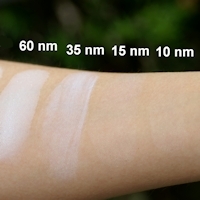 Nonetheless, ZnO of smaller size will give a better transparency, more UVB protection and, in general, more UVA protection when ZnO powder is used directly in a formula. Kobo offers a range of titanium dioxide products, where the particle sizes are greater than 100nm when measured by light scattering sizing. These non-nano TiO2 are available coated with inorganic and organic surface treatments. Non-nano TiO2 are also available dispersed in various vehicles for easier use in formulating sunscreens. These products have been designed to help formulators develop sunscreen products with high SPF/PFA and transparency without nanoparticles. Kobo offers a grade of Zinc Oxide, where the primary particle size is greater than 100nm when measured by image analysis. 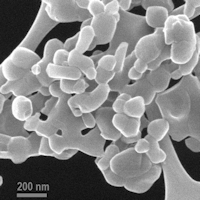 This non-nano ZnO is available coated with either organic or inorganic surface treatments. Non-nano ZnO are also available dispersed in various vehicles for easier use in formulations. They will help formulators develop sunscreen products with broad spectrum protection without nanoparticles. SunBoost ATB is a blend of 3 skin conditioners and soothers at a proprietary ratio. When used in sunscreens in combination with organic and/or inorganic UV Filters, SunBoost ATB shows an increase in SPF and PFA scores by more than 30%. An all natural, Ecocert approved version, SunBoost ATB Natural, is available. SunBoost ATB is also available coupled with High Speed™ TiO2 dispersion TNP50T7. TNP50T7-ATB can provide up to 4.5 SPF units for each percent of TiO2 in sunscreen formulas while delivering all the benefits of the antioxidants contained in SunBoost ATB.